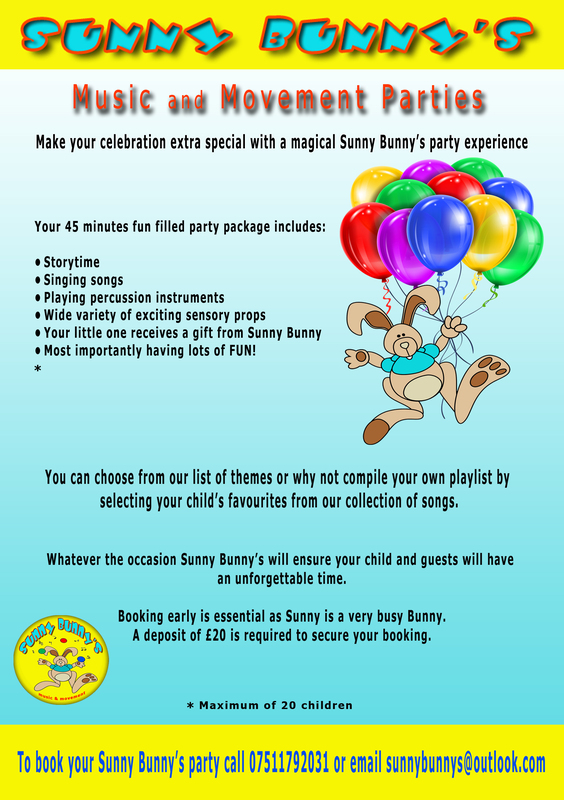 Book Your Sunny Bunny’s Music and Movement Party now! This entry was posted on October 20, 2015 by sunnybunnys. It was filed under Uncategorized . Story time, singing songs, playing instruments, dressing up and using a wide range of exciting sensory props, your little one will also receive a gift from Sunny Bunny. You can select from our wide range of themes or compile your own playlist to include your little ones favourite songs. If you would like to go ahead we take a £20 deposit on booking. We would come out to your venue, whether that’s your home or a hired room. Our nearest class to Whitefield is Tottington library. This is on a Tuesday morning at 10. If you would like to come along for free taster session to see what we are all about, please let me know and I can book you in.